Exclusive! A 300% bonus up to £400 extra on your first deposit! SuperCasino provided one of the first televised roulette services, but how do they fare today? As the foremost broadcast casino in the United Kingdom, SuperCasino certainly have quite the legacy to maintain – they don’t disappoint. The televised programme is slick and entertaining, the presenters and croupiers are uniformly brilliant and having your name read aloud on national television never ceases to entertain. Should you choose to play online or via mobile, standards remain high. 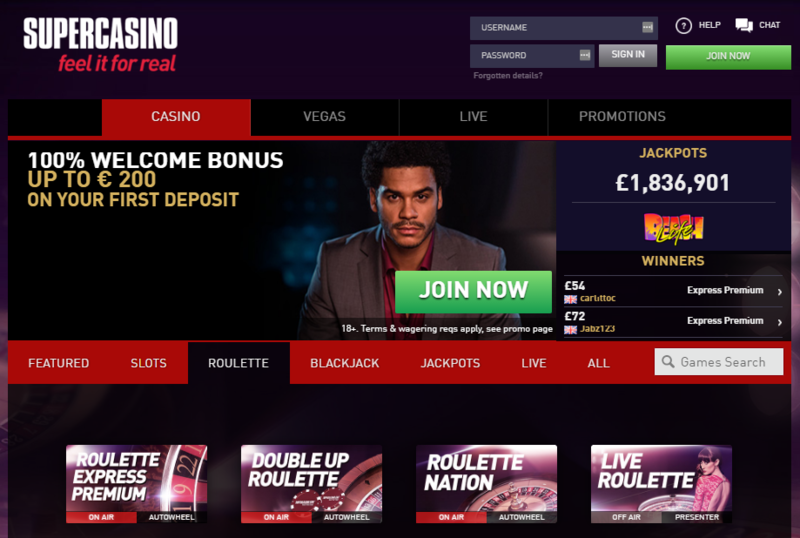 The brand’s web-based casino is attractive and navigable and boasts a few lovely touches. For instance, the menu bar remains visible at the top of the screen during play (all games are played in-browser), allowing for swift navigation. In all, great stuff. My only gripe is that SuperCasino’s downloadable casino software is only compatible with iOS devices. Sorry, Android-users. The number of depositing options is slight compared to some casinos, which is a shame. Nonetheless, SuperCasino’s ‘theft-proof’ transactions boat a special 128-bit SSL encryption – to lay-people, this pretty much guarantees secure transfers. The coveted Alderney license is just the icing on the cake: this is an extremely trustworthy casino. As we mentioned, SuperCasino’s live games are top-notch and consistently so across platforms. You can check out the full list of presenters here, should you want to get to know the team before sitting down to spin a few rounds. This crack squad of entertainers are backed up by a crew of highly-experienced casino croupiers who handle the delicate task of manning the wheel. Should you choose to play on television, you can participate using your web profile, your remote or by phone, resulting in a highly flexible and accessible interface. Great stuff. You can find the complete SuperCasino TV schedule by clicking on the ‘TV Schedule’ tab above. Obviously, live roulette is the focus here. As you’re on this website, it’s safe to assume that won’t be a problem. However, if you’re in the market for something a bit more solitary, SuperCasino provide an extensive catalogue of virtual roulette games, stable games and slots (powered by Playtech). SuperCasino don’t offer the prettiest bunch of games we’ve ever encountered, but they’re perfectly passable should you tire of the live action. When the dealers are on their down-time, SuperCasino run a variety of auto-roulette games. The bonuses at SuperCasino are as tempting as anything else you’ll find on the internet, further sweetened by an exclusive 300% deposit bonus of up to £600 (get the details here). On top of the standard deposit bonus, the casino runs an awesome VIP programme through which they reward regular customers with all manner of random prizes. Super by name and super by nature, the prodigal son of TV roulette has gone from strength to strength and currently ranks with some of the best brands around. A bit more effort spent on the non-live games and this roulette service would be damn near perfect. Highly recommended. The SuperCasino roulette wheel spins around the clock on Sky Channel 862, varying between auto-live roulette and live dealer roulette. SuperCasino also air live dealer roulette on Channel Five at select times of the day for gamblers without a Sky digi-box. All of SuperCasino’s live casino games can be played online 24/7, so the roulette fun never has to end! Visit SuperCasino.com and sign up or read on for TV times. SuperCasino’s mobile app supports Auto Live Roulette 24/7 and live dealer roulette between 18:00 and 04:00. This service is only available to iOS devices, but the website also offers Flash roulette that can be played via other platforms. Visit SuperCasino and complete the form. Receive your free SMS download link. Download your free app and start playing!